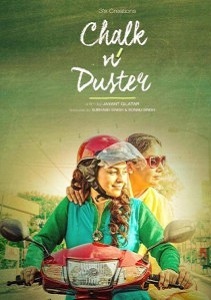 On an overall basis, ‘Chalk N Duster’ is a decent film narrating a soulful lesson. Despite of its tacky presentation and outdated looks, the movie will be still cherished by the feel good type of simple film lovers as it has a strong undercurrent along with few great actors and proper soul attached to it. Chalk N Duster is the unkindest cut. If you have any respect for your teachers - past present or future - give this film a miss. A movie with a solid heart. May be amateurish and maudlin in parts but deserves a watch for what it conveys. CHALK N DUSTER is endearing despite its flaws! It is also a delight to watch so many talents in a single frame. Chalk N Duster picks a topic rarely explored by the film industry and shows the Indian education system in its current form. Watch it to get on a nostalgia trip remembering your teachers as well be presented with the reality of the education system today. Although the movie has been made with the right premise in mind, and has an enviable cast, the shoddy execution makes it a terrible watch. You sit through it because it means well. You may even call it as crude and unapologetic in terms of melodrama, however, it has the heart in the right place. It can be called as decent conscientious efforts to showcase the bond found in between the teachers and the taught. Nothing irritates more than sanctimony and this film is so packed with piety that it looks set to get tax exemption and mandatory school screenings to boot.